In the fall 2018 issue of Ethics and International Affairs, my article on the Empire of International Legalism looks at the political power of legal supremacy in world politics. "The international rule of law is a political system of governance. It rests on the expectation that governments will abide by their legal obligations and so defines what counts as appropriate behavior for states. The relationship between law and politics in global governance is better understood as an empire of global legalism than an anarchy of sovereign states. Legal justification is the lingua franca of legitimation contests among governments, as states strive to show that their preferred policies are lawful and those they oppose are unlawful. Seeing the world this way helps to show the political content of international law: neither a neutral framework that sustains all viewpoints nor an inherently progressive contribution to global order, international law is a political system of governance that advances some interests at the expense of others, and our attention should be directed toward assessing which interests are served by the turn to global legalism and at whose expense." New from the Shanghai People's Publishing House, 2018. 'Hawks as far as the eye can see' - America's alarming foreign policy consensus. My new post at Vox.com on April 25 2018. When the UN Charter made it illegal for governments to go to war with each other, it created the first ever general legal ban on the use or threat of force by one state against another. This has been widely hailed as a dramatic contribution to world order – Michael Byers called it “one of the twentieth century’s greatest achievements.” My article on the ‘Permissive Power of the Ban on War’ opens up this conventional wisdom in two ways. First, I show that the UN Charter does not quite ban war - instead, it regulates the reasons that states may go to war. It is therefore as much a permissive rule as it is a constraining rule. Second, I suggest that much of the impact of international law in world politics comes through this permissive function, and that recognizing it is an important step toward appreciating the close connections between international legalization and global power politics. In the constellation of fake holidays, International Clash Day is a new star that burns a little brighter every year. Invented in 2013, February 7th celebrates the British band who added sharp politics to the energetic, polyglot music of punk rock in the late-1970s. Their message embraced human rights but with a twist: they saw the possibility that law can be the enemy of human rights rather than its savior. The song comes from knowing that legal rights are interpreted and applied by the state itself. In practice, the value of these rights depends on how this interpretation and application are done. To be shot dead on the sidewalk is presumably a wrong. But whether it’s a legal wrong depends on who did it, why, where, and to whom. The legal and political meaning of killing depends on how the state draws lines around accountability. Police badges, stand your ground laws, citizenship status, declarations of war, and skin color are formal and informal features that affect legal accountability. The pragmatic realism of The Clash could come across as mere cynicism - that law promises one thing but delivers another - but it’s also a foundation for a political worldview that challenges the liberal common-sense. At the heart of the standard view is the belief that what’s most important is following the rules. These might be rule of law or rules of global governance. The Clash remind us to ask why these rules are the rules and to wonder about who benefits from rule following. This turns attention to the political content of the rules. The injunction to ‘follow the rules’ starts to seem less like a universal good and more like a partisan intervention in long-running social conflicts. In Julie’s Been Working for the Drug Squad they tell of their friends caught in punitive jail sentences for casual drug offenses. The bureaucratic function of judges - to impose penalties upon rule breakers - feels indistinguishable from the politics of race, class, and power that went into making the law in the first place. The liberal faith in law assumes that it protects the individual against the state. The Clash point to something else: that ways that law serve some interests at the expense of others. Instead of a neutral framework that benefits everyone it is better seen as a political structure that allocates power and privilege. If we were talking about tax law all of this would make for an uncontroversial point. It is easy to see that while tax law imposes its obligations on everyone equally it also favors some people, some kinds of income, some kinds of wealth, at the expense of others. It produces winners in society and also losers, and political fights over tax law are about who sits in which category. But the idea that law creates both winners and losers becomes much less popular when it moves to the world of international human rights. In global governance, an enchanted view of law is common; it assumes that the rules are good for everyone and that there are no losers. On the grandest scale, good governance in world order is often seen as requiring faithful adherence to international law. If only governments were more committed to international human rights treaties then then we could be rid of torture, repression, and all the rest. This is what Stephen Hopgood has called ‘Human Rights’ in the uppercase sense - the collection of treaties, states, courts, and activists who have been granted formal power to oversee, criticize, and perhaps even prosecute violations. The Clash look instead for what Hopgood calls ‘human rights’ in the lowercase. This is the lived experience of people in relation to state violence. From this perspective, the state is likely felt as the main danger rather than a source of protection. It sees human rights as a struggle between the person and the government - it exists when you want to do something that the state wants to prevent. By persisting, you risk a baton to the back of the head, or pepper-spray to the face, or jail or death. What is at stake here are two different views of the relationship between law and politics. On the one side, ‘Human Rights’ seeks centralized political and legal institutions to implement rules and laws, on the theory that these constrain governments violence against people. On the other, ‘human rights’ sees the danger that these will become more tools in the hands of the state, and likely to favor the state rather individuals. The Universal Declaration of Human Rights guarantees a right to freedom of peaceful assembly and association. This is a cornerstone of uppercase Human Rights and in theory enables political protests. In practice, however, it is likely that a permit is needed to hold a public rally and so the practical experience of this right - that is, its lowercase version - depends on the terms that the state places on these permits. In the US, local authorities regulate protests in the interests of traffic flow, pedestrian access, safety, and fairness. They may also require that organizers buy insurance and perhaps reimburse for security. The terms of the permit, and thus whether an assembly is lawful or not, are decided by the government. Don't you know what happened down there? In the lowercase version, the lived-experience of human rights is undermined rather than protected by American military activities. Personal safety requires that people find a way to avoid getting hit by all those Washington bullets. Chinese, British, and Russian bullets are no better. Human welfare - and human rights - are threatened by the military adventures of powerful governments, regardless of whether they aim to prop up or topple local authority. But we should be honest about which way the law is looking. It encodes the interests of the state and is interpreted and applied in a manner that reflects them. This is not a novel idea - Hannah Arendt wrote Eichmann in Jerusalem to explore what happens when bad policies are legalized by the state and Judith Shklar wrote Legalism on courts’ power to decide political questions. For The Clash, human rights exists in the fight between the state and a person. It comes alive in the desire of a person to do what the government does not want them do to. In that fight, the laws are likely on the side of the state. Investing more power in states and laws may be a backward step. The Clash tells stories from below, of regular people who find themselves targeted by powerful institutions and remind us to listen to their stories. Their objective - and the central premise of punk rock as a political movement - is to create space in which people can live outside the lines that are drawn for them by others and not be beaten up, jailed, disappeared or killed for it. To get there, they chart a refreshingly clear philosophy on the relationship between law and politics. On International Clash Day, turn up the volume and remember to let fury have the hour. Listen here to my December 14, 2017 conversation with Jerome McDonnell of WBEZ Worldview about How to Do Things with International Law. 22 mins. A new podcast about How to Do Things with International Law, hosted by ACUNS - the Academic Council on UN Studies. Follow their long-running podcast series about the United Nations and global affairs at acuns.org. The journal of Contemporary Security Policy has a new special issue on targeted killing and changing norms of international order edited by Jodok Troy and Martin Senn. 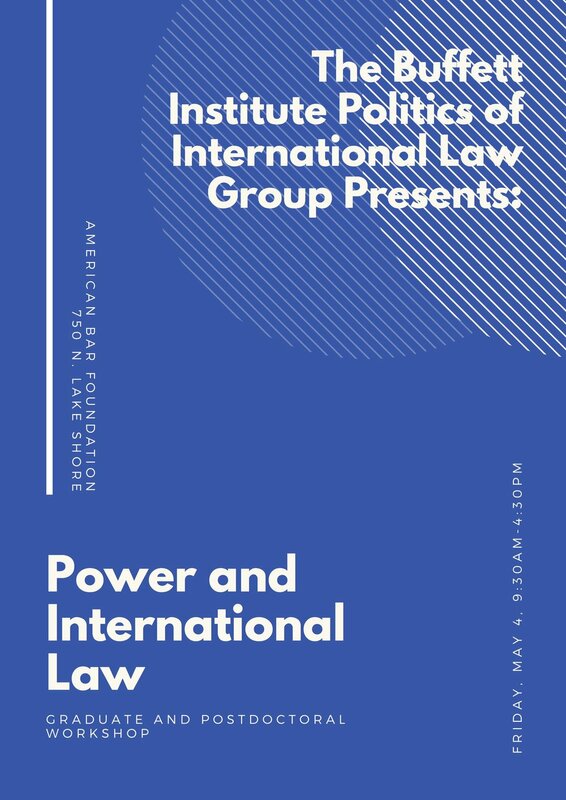 A conference in Chicago on international law and international organization - new directions in research on global order as history, law, and politics. Apply here. The Oxford Handbook of International Organizations is now available. "The UN Security Council: Future Prospects for a Compromised Hegemon"
A comprehensive look at international organizations in contemporary politics, law, and sociology. Forthcoming November 2016. Workshop for graduate students and others on international law and international organization at Northwestern University in Chicago Monday December 5th 2016. The workshop aims to support new research on interdisciplinary topics and approaches to the history, law, and politics of international organizations and international legalization. Feel free to share the announcement below.